in California to cover hearing aids for children. For more information, click here. March 14, 2019 – Gadgets! Gadgets! Gadgets! Can’t hear your alarm in the morning? Worried about hearing your smoke alarm in the middle of the night? Would love to know if your Amazon package is at the door? No worries! Katie will bring various alerting devices for you to explore—doorbells, alarm clocks, phone ring flashers, soundsignalers, pagers—to name just a few. Come check them out! 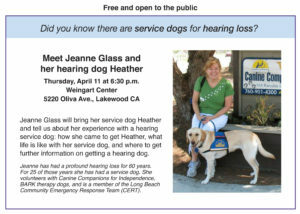 Katie Wright is a past president of the Long Beach/Lakewood chapter of HLAA, and current Chair of their HAT (Hearing Assistive Technology) Committee and works with multiple other committees related to hearing loss and technology. She has worn hearing aids for almost 20 years and is passionate about helping others discover how technology can help them live better in a hearing world. It is with great sadness that we learned of the passing of one of our most active members, Louise Hennessy Allen. Her Celebration of Life is set for Saturday, February 23, 11:00 am – 2:00 pm at the Grand in Long Beach (4101 E. Willow Street). Light refreshments will be served. Please RSVP to Kaitlin.Hennessy@gmail.com or text/call 949-637-5898. This is an open invitation to all of her HLAA friends. Dr. David DeKriek, Au.D., our Professional Advisor, with be telling us all we ever wanted to know about our audiograms. Bring yours with you! A good time was had by all at our Holiday Party! We had a drawing for presents, an ice-breaker game and more than enough food. Ellen Mathis shared with us her hearing loss story – her difficulties and her triumphs. Join us for our next meeting on January 10! December 13, 2018 COME JOIN US! 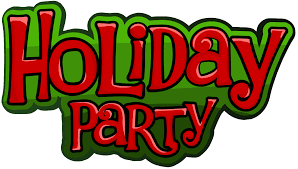 We’re celebrating the Holiday season with a party! Bring a dish to share or just show up! We have a game or two to play and good food to eat. We’re starting a new part of our meetings; we plan to have someone take 5-10 minutes and tell their hearing story. Then on the following Saturday is our last HAT demo for 2018. If someone you know is struggling to hear even with hearing aids, come see some devices that might help. Great Christmas present ideas! We can help with face-to-face communication, watching TV or using a computer, or a device to let you know someone’s at the door.